'Please tell me if I'm wasting my time'; Because, just because. | Almost Amazing Grace. 'Please tell me if I'm wasting my time'; Because, just because. I'd like a song, sang just for me, inspired by that feeling you get when we wake up in your bed and the sleep is still fading away. I'd like a perfectly mixed whiskey and Coke, a cigarette out the window, a mischievous smile and a promise for tomorrow. Watching your hands work, smiling at the back of your neck, feeling your arm around my shoulders and the warmth of your gaze. Those brown eyes, that smile in your voice, the feeling in knowing and the wonder of hoping. I want somewhere to stay in the morning, the taste of coffee in the air between us, no rush to leave and no harm in being. Last night's clothes and fresh apple hair. Cappuccino and latte. Perfect compliments and complementing perfectly, never needing anything more or ever having to settle for less. 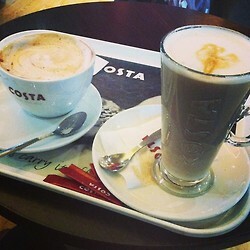 Taking leave of my senses and being pulled back to the shore, staring at the waves out the window and deep into my cup. Hearing a song, wondering if you hear it too, if you know how it reminds me always. Feeling drunk, being fed doubles, freaking out in the toilets. Dancing without care, feeling your eyes on me, blushing at nothing, not stopping myself ever. Kettle boiling, gentle pulling, dark outside and warm within. Friends teasing, while all the time hoping I'm done being dumb, that finally I've found something worth hanging on to - or someone who might hang on to me. A tiny patch of beauty in this ugly old town, perpetual May Day in the colder months. Walking along to nowhere in particular, happy as we go, going home to one another and always on an adventure. That's what I want.